I’m trying to make more of an effort, whenever I write or talk about gentrification, to point out that the real issue is larger: that gentrification is only one aspect of income segregation – specifically, the part where the borders between rich and poor neighborhoods shift – and that the real problem is that we have such sharply defined rich and poor neighborhoods to begin with. I might also throw in that income segregation used to be much less severe. Anyway, one problem with our obsession with gentrification as the end-all of urban equity issues is that it discourages us from talking about other important things happening in our cities. In some instances, gentrification has become such a dominating narrative that it has completely erased broader trends that we really ought to be concerned about. Case in point: Brooklyn is getting poorer. Does that shock you? Were you under the impression that all of Brooklyn was in the process of becoming one giant pickle boutique? That would be forgivable, given that nearly every article filed from Brooklyn for a decade or so has been about gentrification. But no. 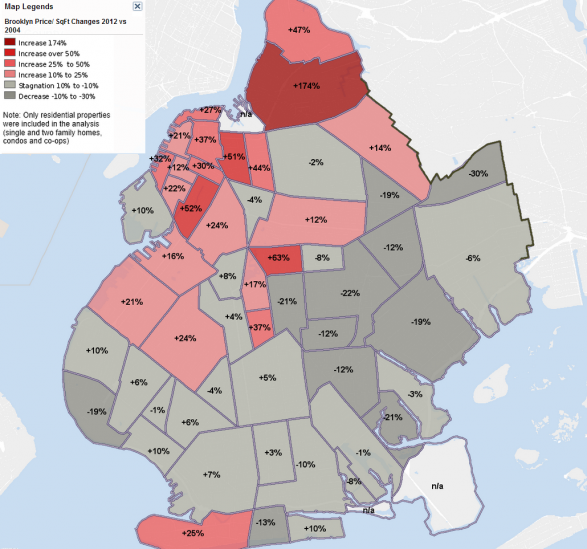 I recently ran across a post from data-crunching blog extraordinaire Xenocrypt, which noted that from 1999 to 2011, median household income in Brooklyn fell from $42,852 to $42,752. That’s not a huge drop, obviously. The national median income fell from $56,000 to $50,000, so Brooklyn is actually catching up, sort of, to the country as a whole. But it still got poorer in absolute terms. 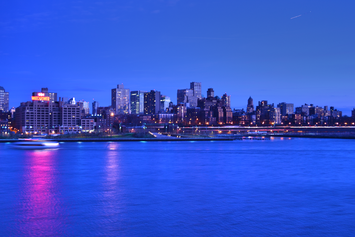 …which is that, indeed, a good three-fifths or so of Brooklyn is actually getting poorer. Have you read any articles about that? No, I will wager that you have not. Neither have I. I strongly suspect that is because they don’t exist – at least not in any outlet that might be considered mainstream. And what about housing prices? So in large parts of Brooklyn, real estate prices are falling. I have nothing particularly intelligent to say about this – these maps were news to me – except that it’s maybe the most dramatic example I’ve seen yet of just how limiting our fixation on gentrification is. I mean that both in a sort of journalistic sense, in that we’re being deprived of an accurate sense of what is actually going on in our cities, as well as from an advocate’s perspective: how can we claim to be working for fairer, more equitable, etc., cities, if we’re ignorant of their most basic economic and demographic changes? This post originally appeared in City Notes on May 3, 2014. Daniel Hertz is a masters student at the Harris School of Public Policy at the University of Chicago. Lead photo: "BK" by Theeditor93 - Own work. Licensed under CC BY-SA 3.0 via Wikimedia Commons. Submitted by peter on Tue, 09/16/2014 - 23:13. Your points are good ones but I don't think the statistics help your case. Starting with the household income data-- you're comparing 1999, which was the peak year of an economic boom, against 2011, which was the bottom of Great Recession. It's not a fair comparison--as you yourself admit, the nationwide median income was 10% lower in 2011 compared to 1999. (I assume the '99 figure is inflation adjusted) I wonder if there is a single large county in the country where median income was higher in 2011. Change the start year and the end year of your comparison it would tell a different story. The same point applies to the housing prices. In 2005 the mortgage bubble was growing and subprime loans were inflating prices everywhere, and 2012 was the low point for housing prices after the collapse of the bubble. Short sales and foreclosures were abundant in 2012. It doesn't make your case to compare a boom year to the nadir of the last decade. As for the statement that "in large parts of Brooklyn, real estate prices are falling".. well, that is certainly not the case in 2014. Houses are selling for double what they were just last year, let alone 2005. And I am talking houses in East New York, not just Williamsburg. You are writing this in 2014, right? At any rate, two thirds of Brooklyn households are renters--and more so in lower income neighborhoods--and a large share of buying and selling homes has been by investors. So are home sales the best metric of economic health?